WikiAfrica offers a physical space where local contributors from Douala, Cameroon can contribute to Wikimedia sites. 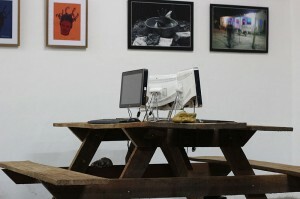 The WikiAfrica space was inaugurated today in Doual’art, a centre for contemporary art located in Douala, Cameroon. For the first time, a computer room with high-speed internet is available for people in Douala who want to participate in Wikimedia projects. Contributors can find documentation there, and will benefit from the help of employees trained to edit Wikipedia. Scarce access to computers and to internet has caused a lack of coverage of African topics on Wikipedia. For example, the French language Wikipedia contains more than 220,000 articles about France, but less than 1500 about Cameroon. To fill this gap, the WikiAfrica Cameroon project is welcoming a Wikimedian in residence for three months, with the goal of increasing articles about Cameroon and encouraging contribution by Cameroonian contributors. This initiative also has a training component: Twenty contributors will be trained to take pictures with provided smartphones and to upload them to Wikimedia Commons. Five other Cameroonians will follow a more complete curriculum about Wikimedia projects in order to be able to train other people themselves. Regular, shorter workshops will also take place. Many institutions are very interested in the WikiAfrica project. Several initiatives are currently being planned, including training workshops, content liberation and the organization of Wiki Loves Monuments. WikiAfrica Cameroon is a pilot project initiated by the Lettera 27 Foundation and the Africa Centre, led by Doual’art and supported by the Orange Foundation. After the Cameroonian project, it will be expanded to other African countries.